A few years ago, everyone in the neighborhood received notices that the garbage collection service was changing. A month later, everyone received an envelope containing a prepaid post card with dates and times on it. We had to choose a time to schedule delivery of our new trash container, ’cause someone had to be home to sign for it. A few weeks later, a flatbed truck arrived piled high with trash bins, and went around delivering containers. Every trash container was numbered and by signing for delivery, each resident became the registered owner. Taped to the outside of the container, was a neon-green paper listing the do & don’t rules – do this or we don’t pick up your trash. Under the notice, were the rules embossed into the plastic lid. Next to the embossed rules, was a white decal with the rules listed in Spanish & English – ’nuff already. The container itself is almost five feet high; at least two feet square, and has two over-sized plastic wheels on the back side, for a little leverage when rolling it to the curb. The rules stated that everything in the container must be in securely closed bags, and you can’t put any more than 250 lbs or 96 gallons in the bin. I don’t think I’ve ever had 96 gallons of anything at one time – so I’m good. 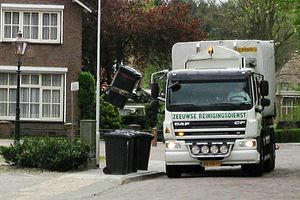 Garbage pick-up is on Wednesdays and the container has to be at the curb by 7 a.m., with the lid opening toward the curb. The container itself must be at least five feet from any object. Which means no parking on garbage day – ugh. There were more rules, but what the heck; at least I’m not the one picking up the trash. And every year, just before Thanksgiving, I get a calendar from the garbage company, along with another neon-green sheet of rules. One Wednesday evening I came home from work and my trash container wasn’t at the curb – it had disappeared – gone with the wind. Oh well, I figured I’d just call the trash company and get another. The next day when I called, they told me that to get another container I had to file a police report for stolen property – here’s your container number and please call back with the police case number. “You have got to be kidding”, I said. “No, it’s just routine,” they said. I called the police and was embarrassed and apologetic for wasting a cop’s time about a missing trash bin. They didn’t seem perturbed either – here’s your complaint number. I called the trash company back and when I got home that night, there was a brand new container waiting for me – with that taped neon-green sheet of rules and another prepaid post card to sign and return for a new registration and to resume my trash collection. Everything went along as usual, when I decided, about 3 years into this service, to take a Wednesday off work. I would lose some vacation time if I didn’t use it, so I figured splitting up the days in the middle of the week would be nice. Besides, I needed a break to relax and do nothing. One of the nothings I did have to do was put out the trash by 7 a.m.
Around 11 a.m., I heard the faint sound of a truck stopping and going, stopping and going. I was thrilled, after years of following those neon-greens rules, I was finally going to see how helpful I’d been to the garbage men. Waiting outside, I didn’t hear any voices, no talking at all. I could hear something that sounded motorized, like a low hum, a shifting of gears, then a high whine, followed by a grinding noise – but no chit-chatting, no containers thumping on the streets, no other sounds but motorized ones. On garbage day we have alternate street parking, and when I looked down the block, I saw a big white truck pulling up, stopping in the street a few feet away from the curb, with the cab being a little past the trash container. It took a few seconds for my brain to register what I was seeing – I was stunned – I could not believe my eyes. It was an immaculately clean white truck – that was part of the shock – every garbage truck I’d seen was gray – a definite dirty gray, dripping, oozing gray. Then, attached to the truck’s passenger side, nearest the curb, right behind the cab, was a bright red vertical metal bar. With a hum, two mechanical arms seem to fall from that bar, toward the curb, then unfolded and opened wide to lay flat against the side of the truck. Still humming along, the bar and its outstretched arms, slowly and precisely, angled out toward the trash container on the sidewalk – when suddenly the arms snapped shut around the middle of the bin, hugging it tight! With the arms clutching the container, they retracted slowly to the bar on the truck, and with a grinding whine, the container rose up along the vertical bar until it slowly arced over the open trailer – hanging there for a second or two. The astonishing part of this was that as the container rose higher and higher in that smooth sweeping arc, it began it tilt downward just as smoothly toward the truck’s open cargo area. Finally, just before I thought the container was going to fall top first into the truck’s cargo area, the lid opened and the trash spilled out – a marvel. Since everything in the trash container was in nice, neat closed-tight bags that’s what fell out – plop, plop, plop – three bags full! I watched this phenomena again and again, walking up the sidewalk to the tune of the humming – truck, container, bar, arms, hug, arc, open and dump! There was only a driver working levers and buttons, and he never left the cab. Every trash container spilled out closed bags and everything plopped right into the truck’s cargo area nice and neat. Sometimes the rules work – and this year, the garbage man will be getting less of a tip.